The flowing images and digital sound create a multiple spectacle with the masterpieces of Van Gogh and a digital journey to the places he lived and worked; Amsterdam , Paris, Arles and Saint-Rémy de Provence. A big multimedia exhibition of sound and image presenting the works of Vincent Van Gogh, in an interactive process with the public, will be shown at the Athens Concert Hall from November 7, 2017 to March 5, 2018. The 3,000 paintings of the great Dutch artist, his sketches along with animated images are projected everywhere with the system of advanced technology SENSORY4™; on the columns, the ceilings and the floor. In a space of 1,500 m², forty multi-channel high resolution projectors and high fidelity sound create a three-dimensional display on these multiple surfaces. 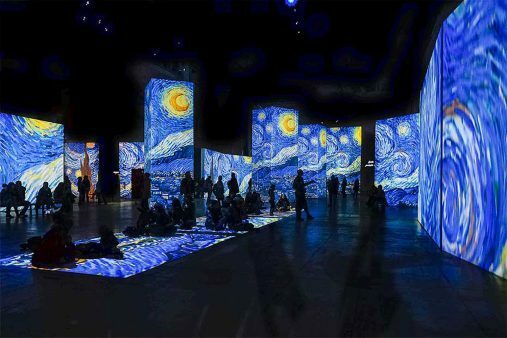 The three dimensional visual art exhibition called “Van Gogh Alive – The Experience” has, to date, toured 35 cities of the world and has been visited by more than 10,000,000 spectators, report the organizers.